Have you heard of BabbaBox? I never did until just recently and I was pleasantly surprised! 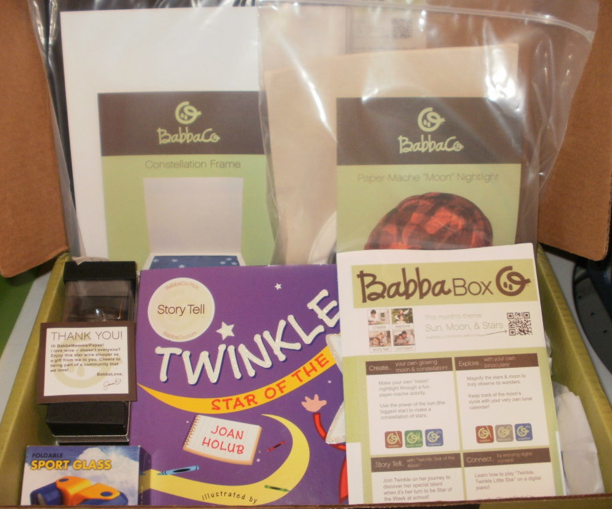 BabbaBox is a subscription based activity box for kids ages 3-6 that comes to your child each month. If you are a busy parent (aren't we all? ), BabbaBoxes are a great solution to bring meaningful activities to your children without having to get all the materials or plan out the activities...everything you need comes in the box. BabbaCo sent my daughter a BabbaBox and we have been enjoying all the activities the past couple weeks from The Sun, Moon, and Stars Box. Each box contains activities that relate to Create (art projects), Explore (outdoor world), Storytelling (books), and Connect (downloadable programs). Under the "Create" activities we made a Moon Nightlight (so cool!) and experienced making sun prints and learning about constellations. Under "Explore" we observed the Moon with these cute little binoculars and recorded the phases on a chart. We've always observed the moon, but it was great to reinforce this and understand why the moon changes. 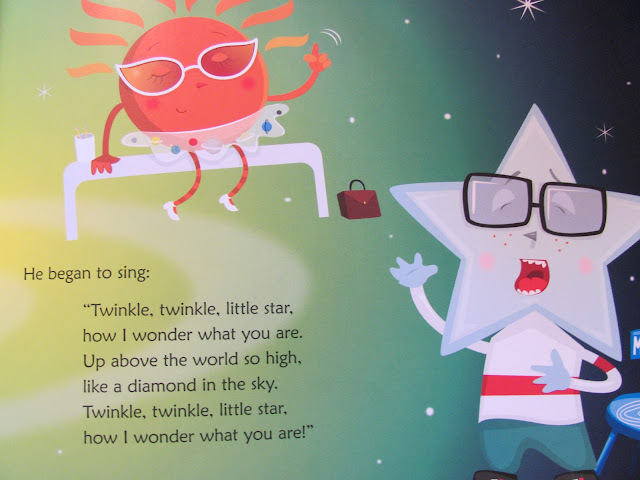 Under "Storytelling" we received this wonderful book "Twinkle, Star of The Week" by: Paul Nicholls that goes wonderful with the theme and in reinforcing lots of of Science about the sun, moon, and stars. You can also download activities to go along with the book. BTW....My daughter absolutely loved this book! Under "Connect" we were able to download different learning activities to our IPad....how cool is that? I love how BabbaCo has involved technology into their activity box. If you are looking for activities that are fun, educational, and help you to spend quality time with your kids, then a BabbBox Subscription is a great solution. You can try out one BabbaBox for $29.99 or you can sign up for a yearly subscription for $299.99 and you get 2 boxes free. To order your BabbaBoxes you can go to the BabbaCo. Website. Either way check out this video below to find out more details. If BabbaBoxes are not in your budget and you know your child would love something like this, put it on their gift list! I have yet to try a Babbabox. Looks really nice! I really should try one out!